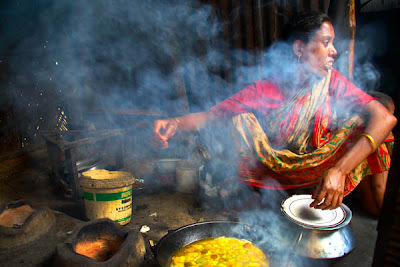 Sajila is a working mother living in the Korail slum in Dhaka city. She got her husband, mother-in-law and three children (two daughters and a son) in her family. As her husband cannot afford all the maintenance of the family alone, Sajila works as a day labourer to support him. Our story begins when Sajila is expecting again. The poverty-ridden family could not be happy with the possibility to have the family even more extended; nonetheless, Sajila continues nurturing her hope to have another male-child this time. Quite understandably, it was not possible for Sajila to have the extra cares or medical support an expecting mother should get. The family will starve if she does not work, so she continues with her heavy work as a day-labourer. This was definitely the last thing a pregnant woman should go through. However, I began my photo shoot on Sajila when she was four-month pregnant. She lives in a small, suffocating and unhealthy room in the Korail slum, which is surrounded by lake. As it is in most of the slums, there is also no doctor or medical service available here in this slum. There are indeed some midwives helping the pregnant mothers in the slum though. But their ability is very much questionable and giving birth to a child under their supervision is unsafe, it even leads the mothers and children to death often. 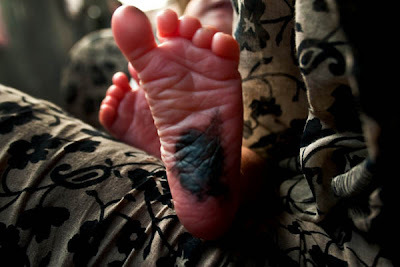 Death-rate at the pregnancy period in Bangladesh is 440 among every 100000; highest in the world. Death rate at child birth is even higher. Since 2007, the rate is 151(either child or the mother) in every thousand. As for the children, the number is 61 per thousand. 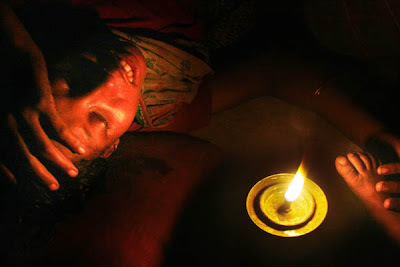 The reason behind this high death-rate is most of the child-birth in our country is maintained by untrained midwives. 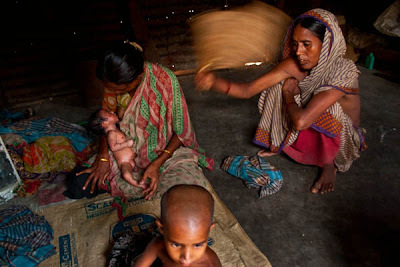 Due to economical insolvency and lack of proper medical service, Sajila also decides to give birth to her child under the supervision of a midwife. Sajila believes, if she has God by her side, she will make it safely, for all her three children have been born this way. 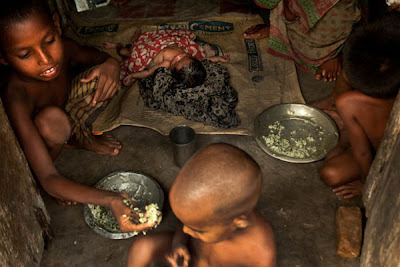 Her economical condition was even worse during her pregnancy and she even had to starve for several days. Even though, Sajila did not forget to take advice from the midwife about the dos and don’ts. Finally on the due date, she gives birth to her child under the guidance of that very midwife. Without any modern facilities or medicines, in an unhealthy atmosphere, Sajila have her baby boy delivered normally. It might sound incredible to many, but Sajila walks herself to home with her son only after an hour. Saikat Mojumder is a photographer from Bangladesh who recently finished his graduation from South Asian Institute of Photography (Pathshala). See more of his work at http://www.drik.net/ and http://www.flickr.com/photos/37369472@N03/. the story, the mood, the photos... breath-taking! it is not just a photo essay. it is the other side of the developing countries. outstanding capture. i like the exposure. What wonderful photos, especially the last one. They tell an important story with sensitivity and without judgement.